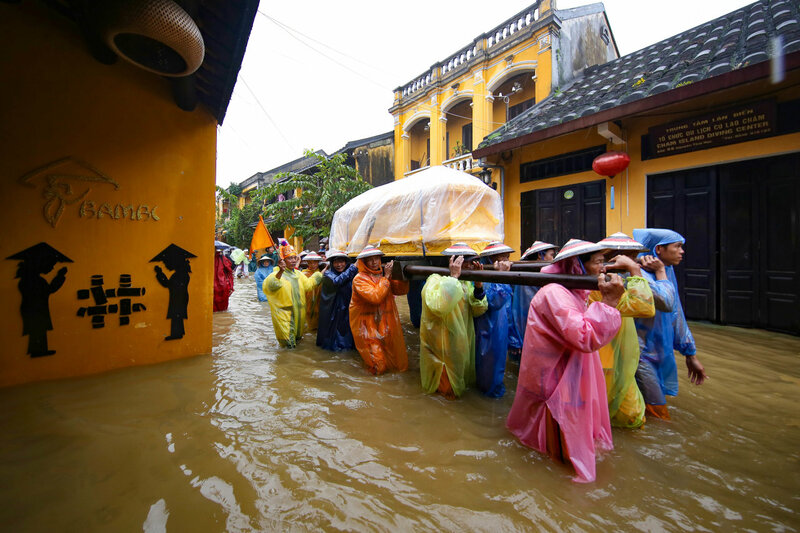 It could not be worse for any family to have a funeral when their neighborhood is inundated in flood water, but this was what happened in Hoi An Ancient Town in central Vietnam earlier this week. A series of photos went viral on the Internet and touched the heart of viewers on Friday, showing a group of mourners kneeing deep in the water while carrying a coffin in Hoi An, the famous tourism city in Quang Nam Province. The photo author, local photographer Le Trong Khang, said he was taking photos of the flood in the UNESCO-recognized site on Thursday when he noticed the coffin carrying ritual. Khang said the scene of mourners carrying the coffin under the heavy rain on flooded streets touched him so deeply that he did not hesitate to snap the moment. In Vietnam, the way the funeral is organized with many rituals, including carrying the casket of the dead to the burial site for interring. In big cities, the transport of the coffin is done by vehicles, but in the ancient town of Hoi An, it is common that the coffin carrying ritual is manually done so as not to disturb the tranquility of the centuries-old place. “I have taken photos of countless weddings, funerals, and all kinds of activities, but have never seen anything like this before,” Khang said. According to Khang, the coffin carriers struggled to find their steps on the streets, with knees deep in water, making the sad scene of the funeral even drearier. Despite the hardship presented by the flood, the group of mourners was able to bring the dead body to its final resting place. Starting from Wednesday, deluges have been covering Hoi An, causing property damages and inconveniences to many locals. Since the beginning of December, Quang Nam has suffered three big floods, submerging over 12,000 houses, destroying nearly 2,200 hectares of crops and plantations, and causing one death.